Learn Kumihimo techniques: loading colorways, working with unusual beads and many tips for making round braids. 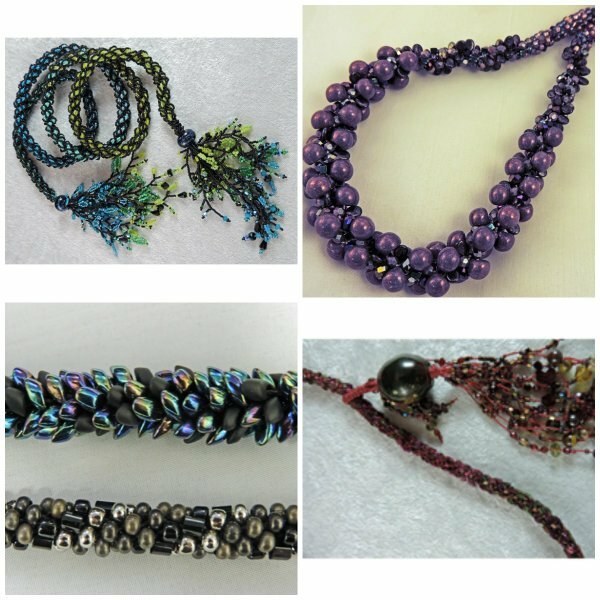 Choose from many different projects (pictured from left to right:) 12-Strand Kumihimo, Spiral Mushrooms, Kumi Spiral Bracelet, Kumi Arts Necklace. Rose Mary may offer more than one class on her teaching days. The first 2 students to register on a given day determine which projects are taught that day. If you register on line we’ll call you to confirm your choice. Note: Our flexible schedule means that recent changes at the shop may not be reflected on line! Please don’t sign up on the website a day or two before class--give us a call to make sure there is a class and that there is room for you. Thank you.